Huddersfield Town have completed the loan signing of Jason Puncheon from Crystal Palace for the remainder of the season. 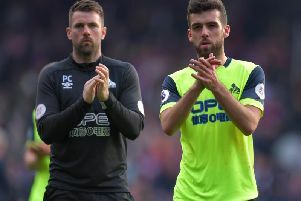 The versatile left-footer adds genuine Premier League experience to Town’s midfield, having appeared in almost 200 games in the top flight for Palace, Southampton, Blackpool and Queens Park Rangers. “I’m very happy that we are able to welcome Jason to Huddersfield Town,” said coach David Wagner. “It is clear that we want to add quality and options to our midfield areas in this January transfer window and I’m sure many of our supporters know about Jason from his years playing in the Premier League. “It is important that our additions in January have the ability to arrive and make an immediate impact in our team, which I’m sure Jason can. He has played in this division for nearly a decade now and knows what it takes to be successful. “As well as being a very good player, he is a great character. He has been the captain of Crystal Palace and is a real leader in the dressing room, which is something we wanted to add too. Wagner has been linked with Liverpool striker Dominic Solanke and Newcastle winger Jacob Murphy among others. “All of them are contracted to other clubs and this is why I’ve no idea if we are able to bring some further players in or not and once we’ve done our business, or as close as we are with Jason, I will let you know,” Wagner said. Huddersfield owner Dean Hoyle has vowed not to let the club “sleepwalk towards relegation”, but Wagner is not sure how active the club will be during the transfer window. “The problem is what the meaning of busy is,” he said. “If making one deal means busy then hopefully we will be busy. “If it means more then I have my doubts, nobody knows. We’ll see what happens. Puncheon’s four Premier League appearances this season have all been off the bench, but Wagner believes the Londoner can have a big impact. “He obviously has a very experienced profile, a leader as well, a player who is used to England and the Premier League,” Wagner said. “He can help us to strengthen our midfield area, where we are very short in numbers after all the injuries. Central defender Christopher Schindler sits out a one-game ban after his dismissal in Wednesday’s home defeat to Burnley, but otherwise Wagner will choose from an unchanged squad.